Scroll Ear – The outer edge of the ear curls inwards or outwards. Otoplasty can be both surgical as well as non-surgical. Surgical otoplasty is normally done under local anesthesia for adults and general anesthesia for children. 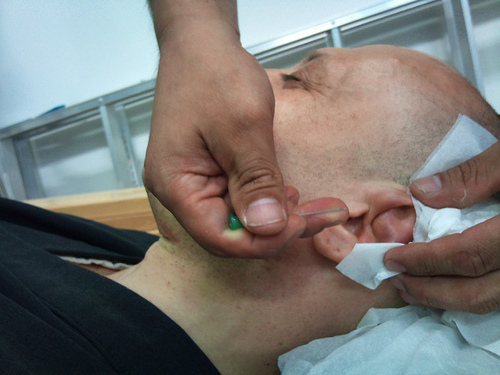 There are several techniques used by surgeons to correct ear deformities or damage during surgical otoplasty. In general terms, the procedure involves making an incision behind the ears. The site of the incision ensures that any scars are hidden in the natural folds of the skin in the area. Once the incision is made, the ear cartilage is either trimmed or reshaped and held in place with permanent sutures. In more complicated cases, reconstruction may be involved. The surgeon may remove cartilage from other parts of your body in order to reconstruct the ear. The surgery normally takes around one to two hours. It is sometimes done in the outpatient department. If the surgery is being conducted on a young child, an overnight stay at the hospital is often recommended. Non surgical otoplasty can be successfully used to correct ear defects of new born children. The procedure is used for babies born with cauliflower ears or pointed and protuberant ears. In the early stages of infancy, the outer ear will be extremely malleable. In order to verify whether you need to undergo otoplasty, you can consult your physician and see if you qualify for the same, as this will help you rectify problems related to your ear, if any. In case your physician recommends otoplasty for you, you must ensure that you learn as much as you can about the otoplasty risks involved. Also, you must keep yourself well informed about what’s involved before and after otoplasty. This entry was posted in Otoplasty and tagged ear otoplasty, Otoplasty, pinnaplasty by Zipheal Editorial Staff. Bookmark the permalink.